Four 13-year-old girls who took pink "teddy bear ecstasy" tablets have been treated in hospital, police have said. 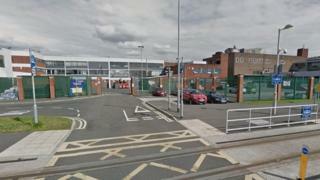 Greater Manchester Police said the girls took the pills near Wythenshawe Civic Centre on Sunday evening. Officers saw the girls in hospital, but they have since been discharged to recover at home, a spokeswoman said. An 18-year-old man has been arrested on suspicion of supplying Class A drugs. Det Insp Gareth Davies said he "doesn't know exactly" what the pills contained. However, they "could have caused devastation for several families", he said. "If you are offered drugs, particularly ones which are a pink and purple colour and have teddy markings on them, then please contact police."